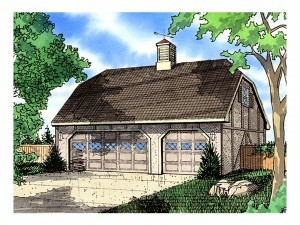 The latest news and information about garage plans! · Use metal when possible. If you have an opportunity to use metal standing seam roofing or even metal cladding you are making a green choice. Metal construction does not require the use of harmful chemicals and wood treatments used in the lumber of traditional wood construction, and it is 100% recyclable should you no longer need your garage, shed or outbuilding. · Install windows in your garage for natural lighting. Using natural lighting whenever possible cuts back on energy consumption. If you plan to spend a lot of time inside your garage, you can reduce energy bills by installing large windows and perhaps skylights. · Incorporate earth-friendly lighting. The exterior of your garage, shed or outbuilding can be lit with the use of solar lights. Use LED bulbs in interior and exterior light fixtures. Consider using motion sensor lights that turn on when you pull in your driveway or walk on the sidewalk saving energy and money. These fixtures will light the way until they no longer detect your motion and will turn off automatically. You won’t have to remember to flip the switch. · If your garage is near your home or attached to the home, do not store flammable chemicals inside, such as a gasoline and oil containers or paint cans. Store them away from the house is a small, locked utility shed that has good ventilation. These simple ideas will help you build an earth-friendly garage, shed or outbuilding plan. Learn about garage plans, the construction process, the latest trends and other general information about your building project. Informational summaries and firsthand accounts from experts and consumers provide a better understanding about building a new garage. Learn more about us. Copyright © 2019 All Rights Reserved .